There are many spectacular apartments in New York, but few rise to legendary status over the years as did Mrs. William K. Vanderbilt II's 27-room maisonette at 660 Park Avenue, Arthur Brisbane's duplex in the Ritz Tower at Park Avenue and 57th Street with a 20-foot-high, 70-foot-long living room, William Randolph Hearst's five-floor apartment with a triple-height hall in the Clarendon at 137 Riverside Drive, and Stewart Mott's quadruplex penthouse at the Galleria on West 57th Street. Probably the most famous, however, was Marjorie Merriweather Post Hutton's 54-room, triplex penthouse in this building. 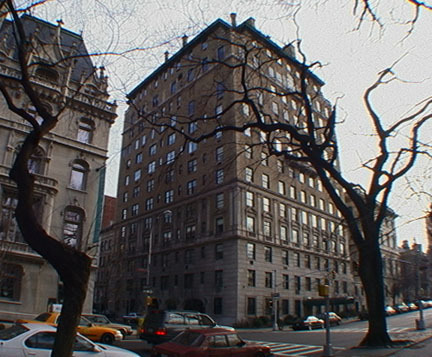 The George Fuller Company erected the building for her when she was married to E. F. Hutton, the stockbroker, and had agreed to sell her townhouse on the site, "but only if the builder would virtually recreate her house atop the apartment structure," wrote Andrew Alpern in his book, "New York's Fabulous Luxury Apartments With Original Floor Plans From The Dakota, River House, Olympic Tower And Other Great Buildings," (Dover Publications, Inc., 1987). Alpern described the apartment as "certainly the largest and very possibly the most luxurious apartment ever created anywhere." It was served by a private carriage driveway on 92nd Street and a private elevator as well as a separate ground floor suite for a concierge. The apartment included a silver room, a wine room and cold storage rooms for flowers and for furs along with a self-contained suite of rooms for Mrs. Hutton's parents, Mr. and Mrs. Post." In his book, "Fifth Avenue, The Best Address," (Rizzoli, 1998), Jerry E. Patterson wrote that "The decoration, judging from contemporary photographs, was an uneasy mixture of eighteenth-century, much of it reproduction, along with homey Americana. The general effect was hotel-like. Mrs. Post, as she called herself after her fourth divorce, spent very little time in this huge layout' the apartment was vacant for many years before it was converted into six nine-room apartments." A large, arched Palladian-style window that was part of the Post apartment is still visible on the building's Fifth Avenue facade. Mrs. Post did not limit her vistas to New York and also owned Mar-a-Lago, the impressive estate in Palm Beach, Fla., that was acquired by New York developer Donald Trump and is now a club. This 14-story building was built in 1925 and designed by W. K. Rouse & L. A. Goldstone. 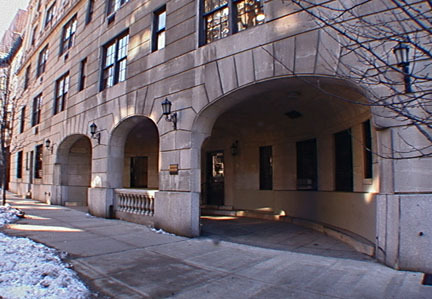 The triple-arch driveway on the sidestreet, which is similar to the one that is the main entrance at One Sutton Place South, is not active and its entry is now part of doctors' offices. The building's canopied and landscaped main entrance is on Fifth Avenue. The building's apartments have excellent views of Central Park, especially since the adjacent building to the south is the low-rise but palatial Sacred Heart School that was the former Otto Kahn mansion. This section of Carnegie Hill is extremely impressive. A long article in the June 12, 2008 edition of The New York Times by Penelope Green describes a rather curious and fascinating renovation of one of the apartments on the 14th floor created out of the Post residence. It was bought by Steven B. Kinsky, who runs a private equity company, his wife, Maureen Sherry, a former managing director at Bear Stearns, and their two sons, two daughters, and LuLu, their dog. They commissioned Eric Clough to design the interiors of the 4,200-square-foot apartment with the instructions that they did not want it to be a "cookie-cutter" space. Mr. Kinsky, who also runs a charter school company, told him that he wanted a poem he had written to be put in a wall and Ms. Sherry suggested it be put in a bottle and hidden "like a time capsule." Mr. Clough, according to the article, got inspired and contacted many friends and "before long, his firm, 212box, was knee-deep in code and cipher books, furnituremakers were devising secret compartments" and doing research on 40 historical figures. The renovation took a year and a half and was brought it about $300 a square foot. Over time, the family began to discover a lot of unusual things and eventually Mr. Clough sent Mr. Kinsky a letter with a poem that directed the family to a hidden panel in the front hall with a book that led them on a scavenger hunt in the apartment with 18 clues. "...the finale involved, in part, removing decorative door knockers from two hallway panels, which fit together to make a crank, which in turn opened hidden panels in a credenza in the dining room, which displayed multiple keys and keyholes, which, when the correct ones were used, yielded drawers containing acrylic letters and a table-size cloth imprinted with the beginnings of a crossword puzzle, the answers to which led to one of the rectangular panels lining the tiny den, which concealed a chamfered magnetic cube, which could be used to open the remaining 24 panels, revealing, in large type, the poem written by Mr. Kinsky," the article stated.